I’m not an experienced scrambler and I found it easy but very precarious at the same time. It didn’t help that there was a bit of slippery, mushy snow at the top when the climbing is the most tough. I’ll get to the scary accident at the end. Let me tell you a bit about the beginning first. I went with my hiking pal Samara and her uncle (A.) and his children aged 10 (S.), 12 (P.), and 14 (An.) For privacy I won’t use any photos with their faces or their names, just a first initial. You park in Coppermine Creek and the trail heads straight up right away. I have a weird body, it takes me forever to warm up. The first two miles of a run my legs are stiff and heavy and I huff and puff and then I get warmed up and start to cruise, it was the same with this climb. The first 20-30 minutes I was huffing and my calves were on fire and I wondered if I really could make it to the top of this mountain. ​The view was gorgeous and Samara and I kept falling behind because we were stopping to take pictures. My favourite part of this hike was the ridge before the scramble to the peak. It was two or three small hills and the views were unbelievable! I thought the scramble up the front facing loose scree was going to be the hardest part. It was long and it was straight up. Our group kept having to stop to catch our breaths and when you do that you have to make sure you have a solid footing in the loose rock. But once we got past the loose scree and figured we just had to climb solid rock from here we were met with a lot of slippery snow. Very slowly we had to pick our way up and through rock and snow. We were almost to the top. A gal was sitting up there and she waved to us and we were really excited to get to the top and sit down and rest. As A. led us around this narrow ledge I looked at Samara and she and I both wondered if we were going to do it. My gut was telling me to not go any further and later she told me so was hers. I don’t know why I ever ignore my gut because it’s always right. Human intuition is an amazing thing. But the kids all went around the ledge and I thought if a 10 year old can do it, I can’t be a big chicken. It actually wasn’t too bad once you were on it and I made it around and told Samara it was fine. We were at the last part of the hike, a climb up this chute to the top. It was about a 20 metre climb. S. & An. led the way followed by A., P., Samara and myself. This is where the scariest accident I’ve experienced hiking (yet) happened. A huge boulder came loose and came tumbling down the chute. It was literally like slow motion and I can see it in my head clear as day. The boulder came barrelling down toward P and I thought it was going to kill her. It bounced (thankfully) and missed her head but came down on her legs and pulled her down the chute a little. At this point it was headed our way and Samara was stuck while I was able to hide behind a corner. The boulder (thankfully again) broke in half and half of it hit Samara in the arm and somehow she was able to catch it and hold it. I peeked back around to make sure she was okay and she was making sure I wasn’t below so that she could drop the boulder. We were so lucky that the boulder didn’t send either of these girls down and off the mountain. I looked up to check on P. and she seemed fine and was asking for her hat but when I looked at her leg I realized it was gouged pretty bad. It wasn’t bleeding but I could see her muscle and fat tissue from 10 feet below. She also had a hole that went all the way into the muscle. I scrambled past Samara and took P. to the side and told A. to come see how serious it was. When he saw it, he knew we had to get her down the mountain. Nobody had a proper first aid kit on them and so he we used one of his shirts as gauze and my lightweight long sleeve T as a bandage. I somehow had service up there so we called 9-1-1 and the dispatcher helped me assess P. for shock or any other damage. She wasn’t in shock, it wasn’t bleeding, and she was able to put weight on it so her dad wanted to start climbing down right away. 911 said they would have an ambulance waiting for us but we had a two hour climb back down this mountain. S. went into hysterics and didn’t want to move and we had to talk to him and get him to come down safely. Those first 5-10 minutes were nerve wracking because I was worried P. would go into shock and potentially fall or that S. would lose his footing or not see because he was so upset. I made jokes and kept talking to everyone and checking on P. every 10 minutes or so. We ran into another hiker who had a first aid kit and we were able to get it wrapped better. But when I pulled the shirt off her wound there were clumps of fat and skin attached to it! It took everything I had not to gag because I didn’t want her to know how bad it was and freak out. We were met on the ridge by a Parks rep (shout out to Jonas) and he helped us decide whether we should keep going or call a helicopter. But P. was doing great! She was calm (not one tear was shed), she said her leg was sore but she could walk, and she just wanted to get off the mountain. I was incredibly impressed!! I mean, I cried like such a baby when I injured my foot and here this 12 year old climbs down a mountain after her leg is gouged. We finally made it down and the EMS was waiting for us. They determined A. could take her to the hospital and I later found out that she has 13 stitches and a drainage tube to get out the rocks and debris. She’ll need a few additional shots to ward off infection. Usually, I enjoy a good misadventure story but there is nothing I enjoy about this one. Except for maybe the fact that I showed I could keep a cool head in an emergency. This experience just showed me how important proper safety is! Jonas (Parks worker) said he always wears a helmet when scrambling Galwey and has ropes and ax picks too. On social media people are sharing their summit pictures and we think “that looks fun- if they can do it, I can do it” and we head up there with little knowledge and unprepared. Before you go climbing a mountain, make sure you are fully prepared. Have a FULLY stocked first aid kit. We had one little first aid kit with a few antiseptic wipes and band aids. Maje sure if you are scrambling you come with a fully sticked first aid kit! Carry an ax pick. If there is any spring snow, it’s super mushy and slippery and could likely have an ice crust ion top of it. An ax pick can help you stop yourself from going down. Have a phone or GPS caller. I am so glad I had my phone and that we had service at the top so 9-1-1 could talk me through how to assess P. If she couldn’t have walked, we would have been able to call for a helicopter. If I didn’t have that phone, someone would have had to try to rush ahead to a place with service. Being stop on the top of a mountain is no joke- bring a phone of emergency GPS caller! I’m sure there are a bunch of other things that can be done for safety and I’ll be looking into them before I head up another mountain. 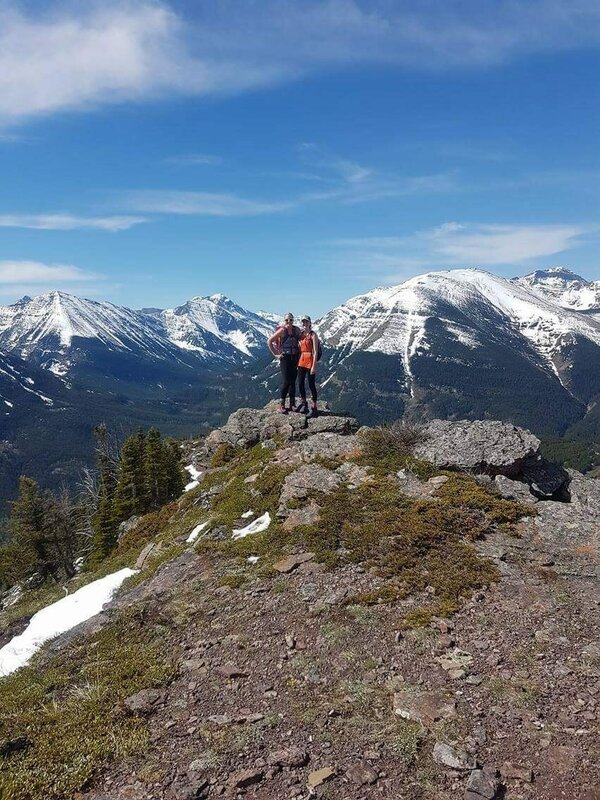 ​My advice if you want to see these gorgeous views but don’t feel comfortable scrambling is to hike up to the ridge and stop there. The 360 degree views are spectacular and it’s a moderate hike up to this point.